In the corporate world, employees leaving a job are often asked to sit through an exit interview with HR about their time at the company. That concept doesn’t exist for Broadway performers, but we love checking in with stars as they finish up a successful run. After playing everyone's favorite street rat-turned-eventual prince for years, original star Adam Jacobs is jumping off the magic carpet and looking forward to a happy landin'. 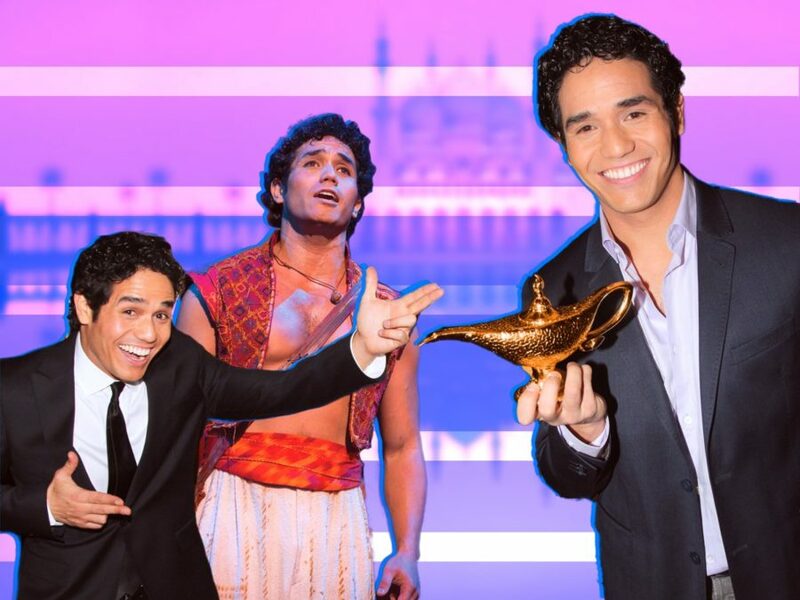 As Aladdin, Jacobs has taken theater fans wonder by wonder over sideways and under, welcomed twin boys into his life, recorded a splendid OBC album and performed at the Tony Awards. Jacobs also answered a slew of questions from die hard fans, talked about getting jacked on Show People with Paul Wontorek, showed us around his Broadway dressing room, performed at The White House and made millions of wishes come true by leading the touring production of Disney's Aladdin. And along the way, Jacobs has remained one of the kindest, funniest and most hardworking leading lads in showbiz. Here, the performer tells us about creating the role of a lifetime in the epic musical, why his lungs and knee joints need a break and what he'll miss most about playing Disney's diamond in the rough. When I got the call from my agent that I was going to play Aladdin on Broadway I was over the moon, and I didn’t even have a magic carpet yet! It’s definitely bittersweet. Aladdin has been a huge part of my life (seven years! ), and I’m so grateful to have done it and also sad to see it go. Wearing a costume that felt like pajamas on stage. Running around like a chicken with your head cut off and then stopping to sing a ballad. Performing at the Tony Awards was absolutely incredible, but in hindsight just the whole experience feels like a huge accomplishment. Aladdin requires a good sense of humor first and foremost, lungs of steel, and hair because you don’t get a wig. It’s all about balance. Not just on the buildings. In life too. So bend your knees. I stopped growing after about 16, but Aladdin has humbled me and also given me confidence with comedy as an actor. When you do a role for a long time, life happens along the way. Having twin boys has really changed my perspective on everything. It’s just time, you know? My journey from readings to out-of-towns to Broadway to tour is absolutely epic. I feel like I’ve reached the finished line on the Tour de France. I’ll miss having so much color and vibrancy in my life every night, between the costumes, sets and music. That’s a void that will be hard to fill with whatever my next show is. I’ll miss those stage door moments with fans, but mostly I’ll miss my castmates. To everyone who I’ve had the privilege of playing with onstage and off at Aladdin I say, "I love you, Salaam, and thank you!"